Monin Butterscotch syrup in stylish 70cl glass bottle. 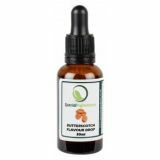 Butterscotch is known as a seductive blend of butter, brown sugar and vanilla aromas, often used as a flavouring for candies, cookies, ice creams, frosting or dessert sauces. 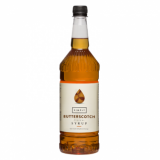 Monin Butterscotch gourmet syrup is a real essence, yet convenient and ready to pour. Add a twist of perfection to all your hot or chilled drinks, or even as gourmet dessert toppings. Colour: Clear colour with yellow glints. Taste: Buttered smell with notes of caramel; creamy, butterscotch candy flavour. Applications: Coffees, milks, cocktails, dessert drinks. Sugar, water, flavouring, colouring agent: caramel E150a.